Perhaps it had to happen. Some say it was inevitable. After 12 trips to El Salvador and having held me together as about 100 families have received new homes. After many hills and valleys walked. After holding dozens of pounds of trail mix in that dirt filled right pocket. 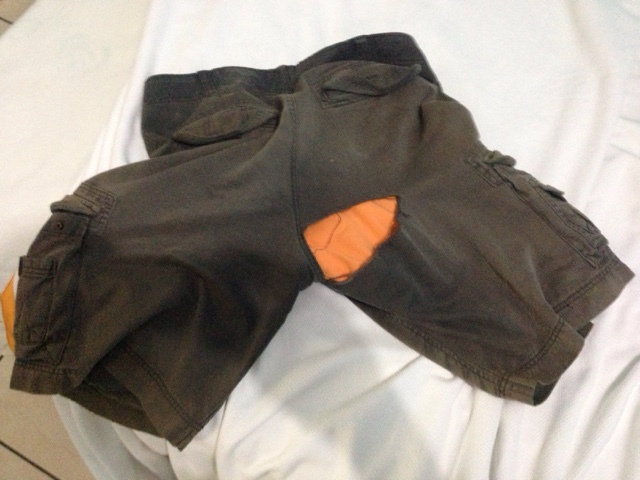 After being inspired by an endless number of faith inspiring stories, then time has come...to say goodbye to my favourite pair of shorts. Early in the day yesterday, as I reached down into a post hole to remove a rock I heard the sound that broke my heart even as it ripped through the faded green material. Goodbye faded-green-el Salvador-house building-shorts. Thanks for always being there....until you weren't. Because of your faithfulness over many years I was not embarrassed to walk around the rest of the day knowing laughter was generated as I walked by. I will miss the comfort you bring. At least the underwear was flashy.